Reserve your seat to this one-of-a-kind performance on Saturday, January 13th, by clicking here! If you’ve ever heard the plaintive wail of a clarinet slicing sinuously through the air coupled with the rhythmic thump of a stand up bass, the deep throated moan of a trombone, and the quivering, piercing notes of a violin, chances are you were hearing the Jewish folk music known as klezmer. At the same time joyous and mournful, klezmer bands have been the live entertainment for weddings and bar mitzvahs for generations. As the years have gone on and Jewish families have emigrated to countries all around the world, klezmer music has evolved, giving rise to a new wave of talented musicians who have taken the old, traditional music and given it a new, exciting twist. One such musician is artist Leeav Sofer, founder of Mostly Kosher, a modern Jewish cultural revival band. Mostly Kosher is a “musical feast that explodes into a global food-fight of jazz, latin, rock, hip hop, and folk,” turning klezmer music on its head and breathing new life into a beloved, if misunderstood, genre. Leeav’s early life was filled with music. His mother is a cantor for their synagogue and the songs of the Jewish faith are inextricably intertwined with his childhood. At the age of five Leeav began taking piano lessons – and hated it. He hated it so much that he threw tantrums until he was finally allowed to quit. But a few short years later, in fifth grade, Leeav decided to take up an instrument again, this time the clarinet. He stuck with music all through middle and high school, going between the piano and clarinet, and eventually found himself with a full scholarship to Cal State Long Beach. Finally, in Long Beach, he felt at home, musically. “If I hadn’t gone to CSULB, I wouldn’t have been able to figure out what I’m capable of,” Leeav said. Before he knew it, Mostly Kosher was taking off. Along the way, Leeav and his bandmates, violinist Janet Mautner Markham, drummer Eric Hagstrom, bassist Adam Levy, accordion/trumpet player Mike Bolger, trombonist Mike King, and guitarist Will Brahm, have been putting their own spin on traditional Jewish music. 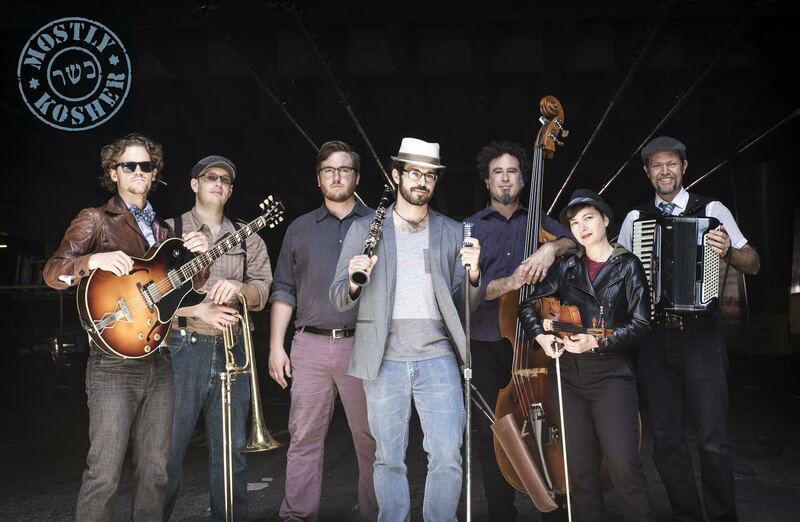 The band’s take on klezmer is fresh and unique, seamlessly merging modern musical styles, like soul and funk, with traditional klezmer songs – and modern songs with traditional klezmer stylings. Leeav and Mostly Kosher want to break down the boundaries that have been keeping traditional Jewish music out of the mainstream. “This cultural music is important, but I feel like it’s our job to refresh and revive it. Well, the mission is more like this: First, to keep the music alive, and second, to lay down the drawbridge and let everybody in. This music is like cultural rock, why aren’t more people listening to it?” Leeav said. Going back centuries, klezmer music was always a big part of the Jewish community. It is the music of celebration, as instruments were only allowed during weddings. It’s woven into the vast tapestry that is the Jewish culture, as much a part of worldwide communities as samba or taiko drums. To this day Leeav strives to give back to his community through music. He works as a teaching artist at Colburn School in LA, bringing music and musical scholarships to Title 1 schools; he started a Jewish Youth Orchestra in the San Gabriel Valley; and is also working to build a non-profit called the Urban Voices Project, a music program that brings music education and music therapy courses to Skid Row for homeless men and women. Mostly Kosher will be debuting one of their original songs on Christmas Eve at a performance at the Dorothy Chandler Pavilion, and hopefully they’ll give Torrance a taste, too, when they’re here in January! Tickets to see Mostly Kosher at the James R. Armstrong Theatre on Saturday, January 13, 2018, at 8:00 pm are still available. Don’t miss your chance to experience a new take on klezmer music with talented, young musicians.